I receive many weird and wonderful emails via this website. I've had emails from people as far away as Brazil, Nigeria and Malaysia, amongst others, from young people asking can I get them a professional football contract with an Irish football club. They don't care which club, and indeed in most cases they don't even know the names of any Irish soccer clubs. I also get many emails from sports gear manufacturers in Pakistan, India and the Far East trying to flog their wares to me. Then there's the one's from people that want to come to Ireland to live and wonder could I help them with the immigration process (!) - and if it helped their cause they would take up playing soccer. After a while I decided to just ignore the obviously whacky ones and to only respond to the one's that seemed somewhat on the level. "I am a journalist with the Dubliner magazine, and I'm working on an article about Dublin's best football prospects aged 13-15. I'm hoping someone from yourselves can point me towards some of the kids playing in the Dublin leagues who might fit this profile." I'd heard of the Dubliner magazine but I knew nothing about it and I certainly didn't know Dean. Following a bit of investigation I discovered that Dean was indeed a serious journalist and that his request was genuine. 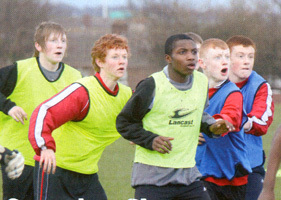 My son David was with a Knocklyon United Under 15 team at the time and he loves football in all its' facets. One of his best friends, Stephen Coghlan, just happens to play for the Republic of Ireland under 14's so, purely through coincidence, I was in a position to recommend that Dean talk to Stephen - with the prior approval of Stephen's parents of course. to do it a third time because if he had missed (and I have absolutely no reason to believe that he might have) it would have ruined the aesthetic of the moment. Stephen Coghlan lines up on the left side of defence for a practice match with his teammates at Cherry Orchard Football Club. The bad weather has not permitted a competitive game in almost two months, but the team keeps fit by training on the AstroTurf pitches near Liffey Valley Shopping Centre. Every player is itching for the thrill of competition, and they attack this friendly game with all the vigour of a cup final. The ball bobbles around the synthetic pitch as players pursue it wildly, crunching into each other to gain a couple of yards advantage. Stephen finally gets his break and, in view of an oncoming opponent, calmly drops his shoulder before shifting the ball onto his opposite foot and gliding away into space. He then neatly releases the ball to a teammate. Im not big into the slide tackles, but I can do the simple things, Stephen told me earlier. You can depend on me. Hes being modest. 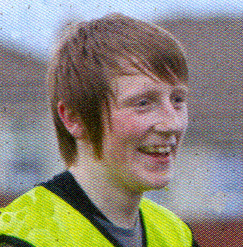 Stephen, just turned 15 years old, is considered one of Irelands most promising football prospects. He was selected for the FAIs Emerging Talent Programme, which helps develop the best youth players in the country through weekly training sessions with qualified FAI coaches. This article was reproduced with the kind permission of the Dubliner Magazine and the article's author Dean Van Nguyen. Dean is a writer / editor that specialises in pop culture, media, sport, arts, fashion, and culture. He is also the founder and editor of popular culture print magazine, One More Robot. To read more please visit the Dean Van Nguyen Blog.